Sinop is in the far north of Anatolia in the middle of the Black Sea Region. Being one of the oldest cities of the region, Sinop is the birth place of Diogenes who was one of the philosophers in the third century. The beaches of Sinop which are covered with great forests present wonderful beauties to the visitors. 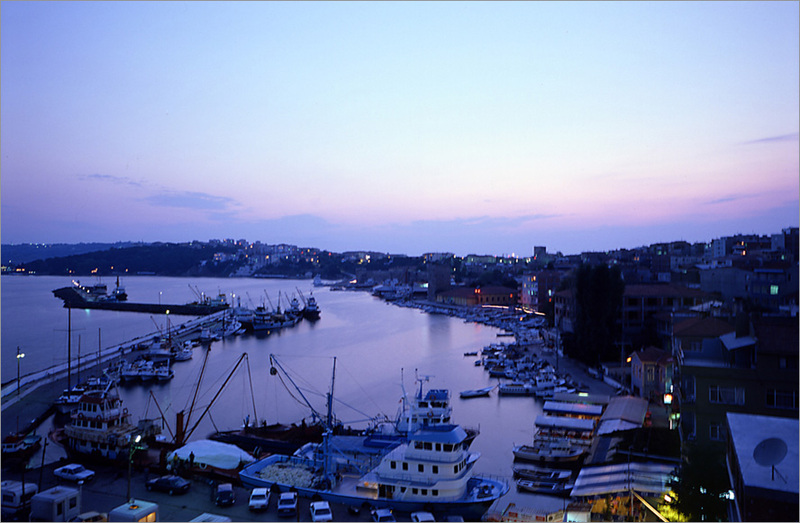 Sinop is one of the natural harbors of the Black Sea Region. 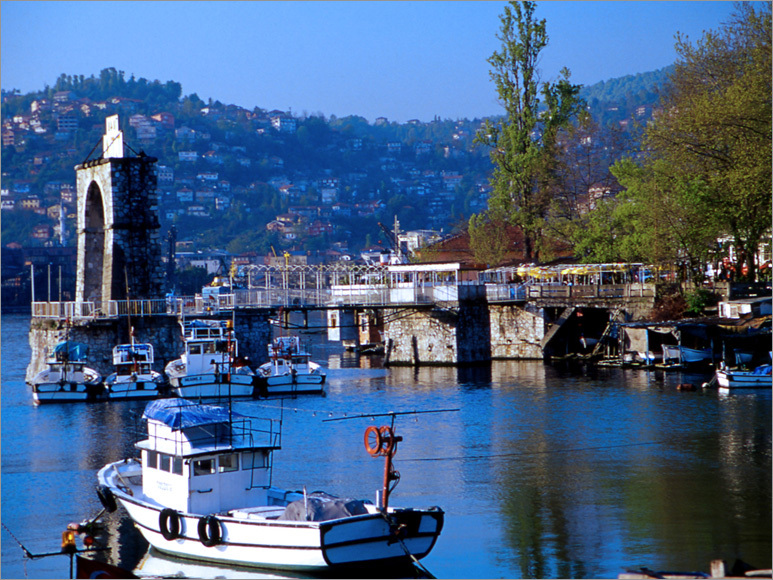 It is located on Boztepe Peninsula which lies forward into the sea in the north from the coastal line of Black Sea. As it is rainy in Sinop, tea is commonly grown and there are lots of streams in Sinop. It is cool in summers and mild in winters. As Sinop is a city with heavy and regular rainflow asa result of the climatic feature of the Black Sea Region, it has a wide variety of forests and flora. Forests are spread all over Sinop on a huge area and there are lots of species and types of trees in the forests. The first information about the ancient times of Sinop is based on the archeological materials found during the excavations in Demircikoy Kocagozhoyuk which are 14 km to the city center between the periods 1951-1954. Then, the parts of the stone devices named as cutters, excavators, and chips found on the sides of the coast in the west of the lighthouse in Ince Burun known to be the northmost point of Anatolia are dated back to the Upper Paleolithic Age (30. 000- 10. 000 B. C. ). During the surface studies executed by the directorate of the museum, 44 tumuluses have been found. After the materials found out in the abovementioned tumulus were examined, it could be understood that the region was settled especially on the mouth of rivers and valleys of rivers close to the coast as of the Calcilitic Age (5. 500- 3200 B. C. ) and that the region was developed hectically during the Bronze Age (3200- 1200 B. C. ). 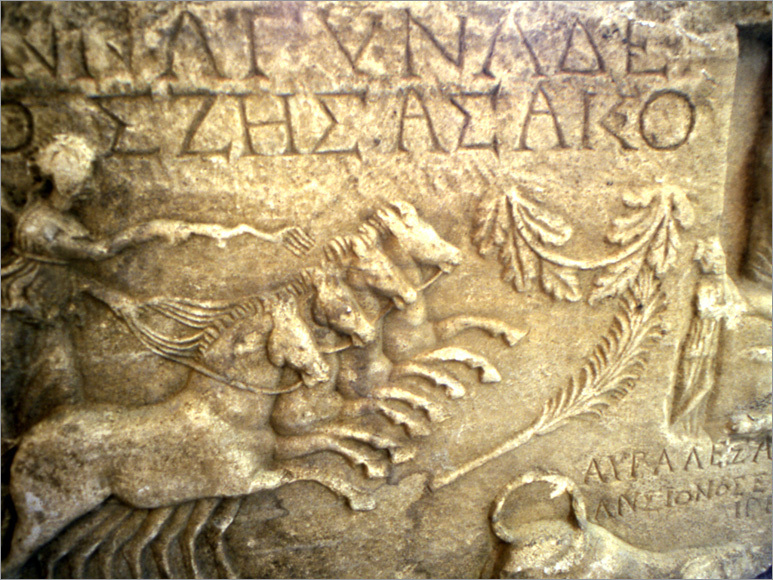 Sinop was ruled by Hittites, Frig, Lydian, Persians, Alexander the Great, Selevkos, Roman Empire, Byzantine Empire, the Seljuk, Candaroglu and Ottoman Empire. There are lots of historical artifacts such as castles, rock graves, churches, mosques, madrasah Turkish baths, fountains, bastion tombs which reflect the previous civilizations ruling in Sinop throughout the history in Sinop and its surroundings. The districts of Sinop are Ayancik, Boyabat, Dikmen, Duragan, Erfelek, Gerze, Sarayduzu and Turkeli. It is 62 km far from the center of the province. The sightseeig places are İstefan Rock Graves, Ayancik Church, İstefan Sulu Church, Railway, Camurca Beach, Akgol, Ayancik Pine Lot, Ayancik Carsi Mosque, Yali Turkish Bath. It is 94 km far from the center of the province. The sightseeing places are Boyabat Castle, Rock Graves of Salar Village, Ambarkaya Grave, Rock with pictures in Dodurga Village, Arimkaya Tunnel and Rock Grave; besides, Kalebagi, Topalcam, Burnuk are the significant picnic areas. It is 121 km far from the center of the province. The history of Duragan dates back to very early ages. Durakhan (Kervansaray), Ismail Bey Mosque, Yagbasan Tomb, Ambarkaya Grave, Terelek Rock Grave, Buzluk Cave are of the sightseeing places. It is 115 km far from the center of the province. The previous name of the district was Kiziloglan, and then it was changed as Sarayduzu. 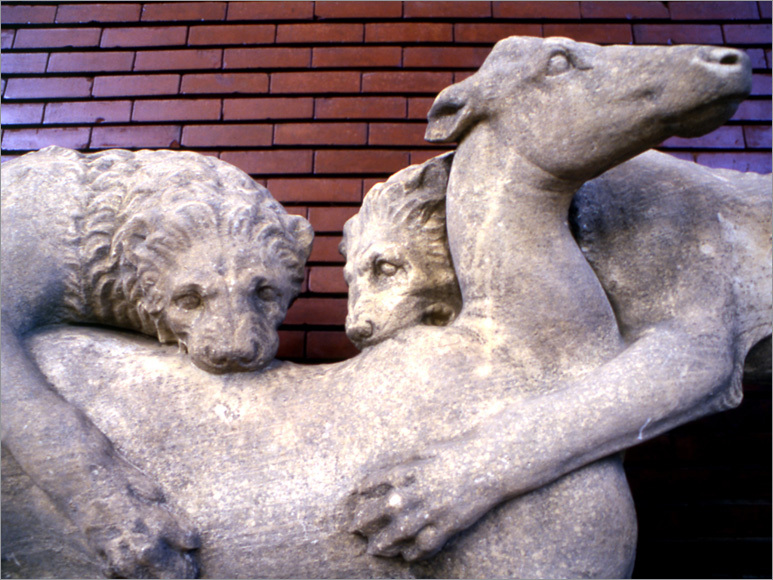 The oldest museum activities in Turkey started in 1921 in Sinop. Cultural items are exhiibited in the sections established in the modern museum halls. There are Pre-history Items Section, Classical Items Section, and Ethnographic Items Section in the Internal Exhibition on the ground floor. The Carpet and Handscript Artifacts Section, Icons Section are on the first floor and the Outdoor exhibition area is in the garden. The place of the prison was the biggest shipyard of the Ottoman Empire in the Black Sea region. The prison was constructed in the place of the previous shipyard in the internal castle of the prison. It was used as prison after 1887. It is surrounded with high castles. It was so difficult for the prisoners to escape from the prison due to the high castles. The old prison which was allocated to the Special Provincial Administration of Sinop Governorship is now used as a museum today. The castle was constructed on the peninsula after the 7th century B. C. in order to protect the city. It was used after some renovations by the Roman Empire, Byzantine empire and the Seljuk. Most parts of the castle are still surviving. It has 2050 m. long, 25 m. High and 3 m wide walls and it has two entrance gates. It was constructed after the conquest of Sinop. It is the building of the Seljuk. It has a big garden. It has a rectangular design and has five domes. There is a fountain in the middle of the garden and there are the tombs of Isfendiyarogullari on the corner. .
Other significant mosques of Sinop are Kefevi Mosque, Saray Mosque, Mehmet Aga Mosque, Cezayirli Ali Pasa Mosque, Meydankapi Mosque and İskele Mosque. It was constructed during the Seljuk Empire. The tomb was constructed on the place where Seyyit Bilal from the Hz. Huseyin’s family and who was the commander of Arab armies died a martyr. Other significant tombs of Sinop are Gazi Celebi, Sultan Hatun (Aynali Kadın Tomb), Hatunlar, Yesil Tomb, Isfendiyarogullari and Cece Sultan Tombs. The building which is thought to have been used as a theatre or bath during the Roman Empire was changed into a churched by the Byzantine Empire in the 7th century. Some of the frescos in the internal part still exist. 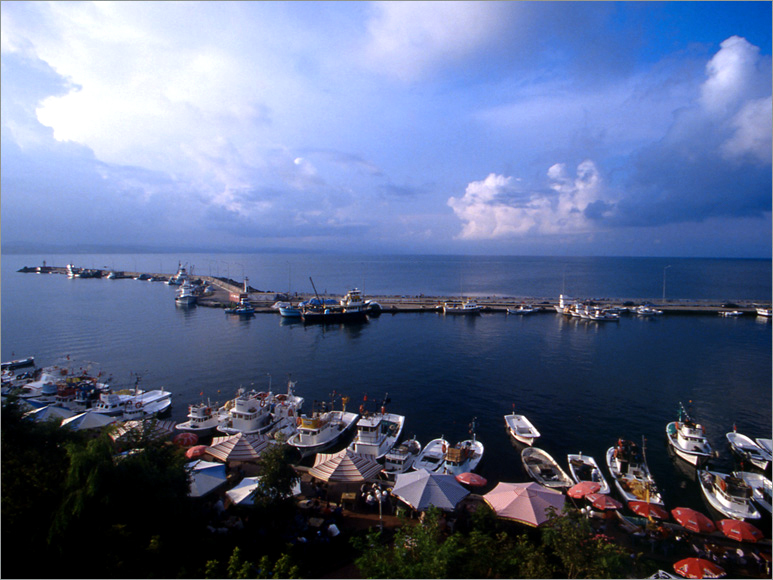 The area is surrounded by Sinop, Central district and Abali Village in the Western Black Sea Region. 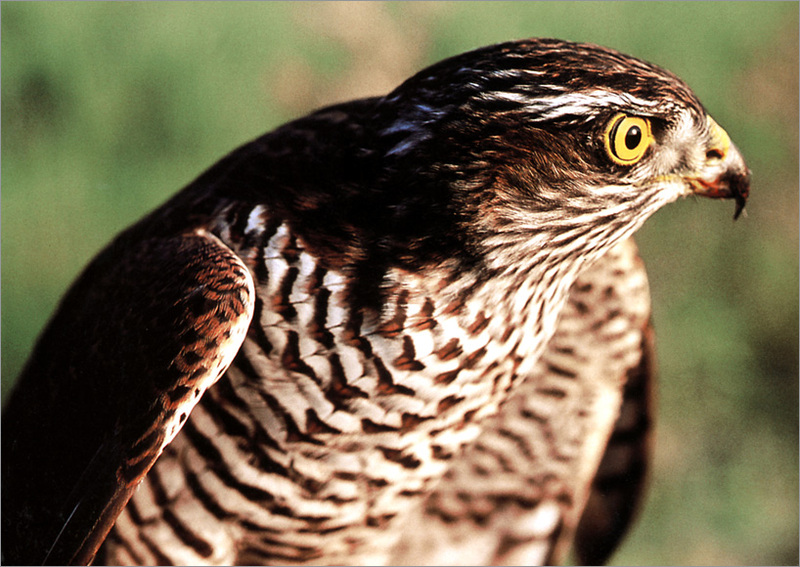 It has the combined ecosystem of sea, coast, lake, watery areas and forests; there are lots of different species of waterfowls, predatory birds, roe deers, lynx, jackaroo, swan which are endangered; furthermore, it has a wide range of flora consisting of wild grasses, beech, hornbeam and oak, ash tree which is the typical specie of the mixed forest types. The plateaus are located in the 35 km southeast of Gerze - Calbogazi city and it is possible to get to the city only by paths. Transportation lasts 45 minutes by ca from Gerze beaches. The plateaus on the 1350 m altitude do not have any infrastructural plants. 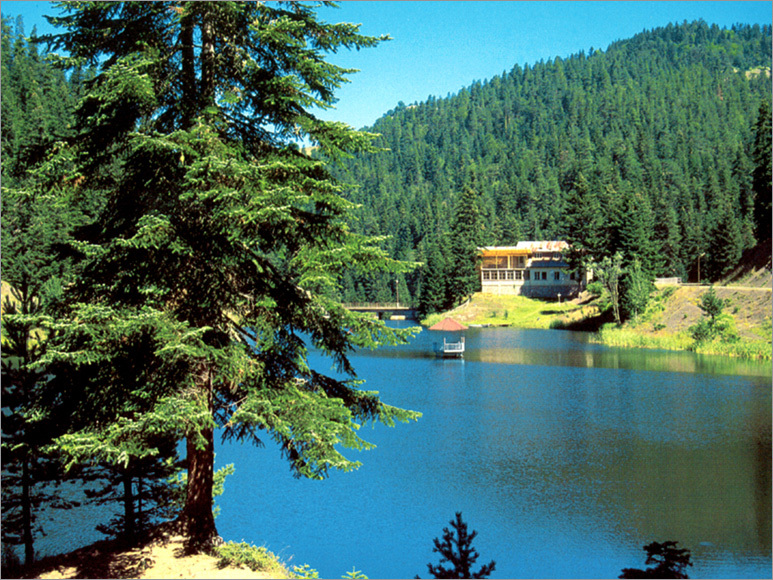 It is 12 km northwest of the district called Turkeli. The first 10 km of the road is constructed and 2 km of it is path. The plateau on 800 m. Altitude is a natural viewing place of Black Sea. There is no infrastructure apart from water and electricity. In order to get to Akgol you will have to follow a 4 km path after the turning junction after 44 km of Ayancik- Boyabat road. The nature of Akgol is not disturbed and there are ten thousand plant species which constitute a reason for preference for botanical studies. Red spotted trout are produced in the lake formed by blocking the mouth of Yemisli River. The cave is in Inalti Village which is 35 km to the district Ayancik of the province Sinop. Transportation can only be provided on non-constructed road but you have the opportunity to view the beautiful landscape. The distance between Inalti Village and the cave is approximately 400- 450 meter; and the slope is very steep. 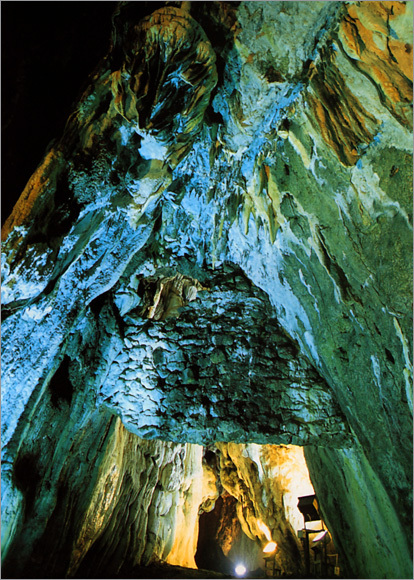 The entrance to the Inalti Cave is rather wide and high for 350-400 meters inside the cave. The width of the cave is 3- 6 meters and the height of the cave is 5- 25 meters and it is like a tunnel. The first part of the cave of 350- 400 meters there are travertine formations on the walls and some small and big- sized stalactite formations in some places. The total length of the cave is 700 meters and after the 400th meter it is watery and muddy. The distance of Hamsilos Cove which is surrounded with green forests and colorful flowers and which is lying into the sea like a river to the city center is 11 km. It is a wonderful picnic area where sea, forest and lake are all together. It is 21 km to the city center. It shelters various shooting animals. The nature in here is announced to be under protection. It is in the west of the city. It has a very long beach of kilometers with 15-20 meters width. Akliman Picnic Area arranged by the Forest Administration Directorate can meet all kinds of needs. Moreover, there are motels, camping areas and promenade areas along the beach. It is located at the entrance to the city at a point towards the inner harbor, and it is surrounded with pine forests. There are social facilities and cabins. The beach is a place where you can both have picnics and swim during the whole summer. It is adjacent to the Forest Camping Area. 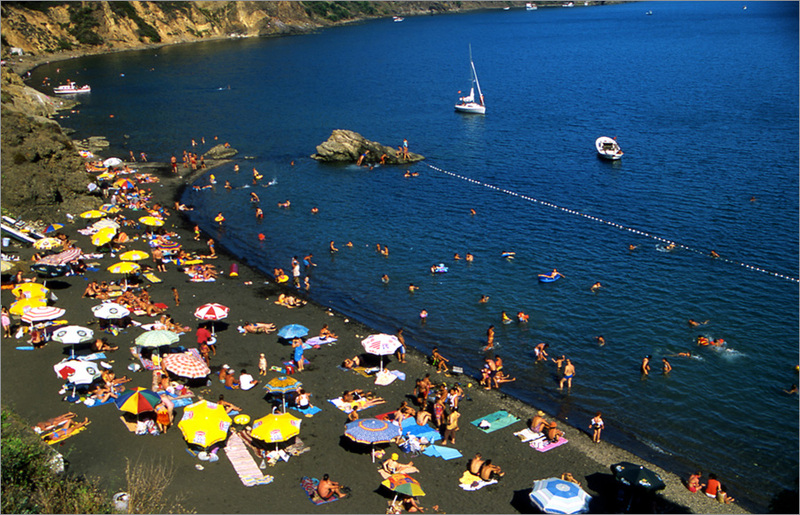 The beaches and facilities are the property of Sinop Municipality. It is a very beautiful picnic area. There are tent and camping areas. It is 2 km to the center of the province. It is on the way surrounding Sinop Peninsula. The name of the district comes from the black and thin volcanic sand. There are public and private hotels, holiday villages, restaurants, bungalows, caravans and tent areas. It is located on the 47th kilometer of Sinop- Boyabat highway. It is surrounded by fir trees. 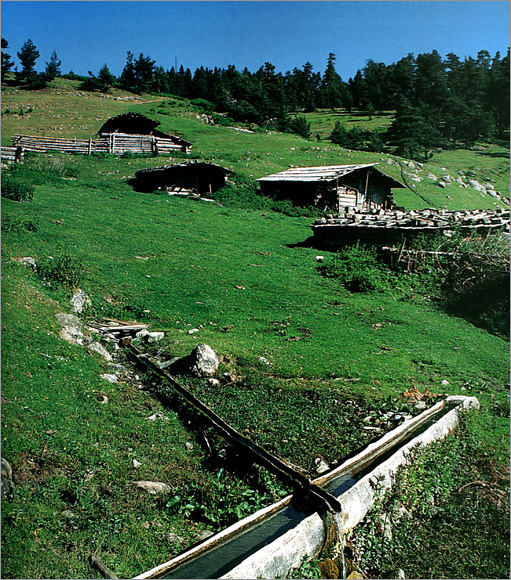 The drinking water in the forest is known to be healthy. It is 20 km distant from Sinop and located on the way of Sinop-Erfelek. It is familiar with its traditional festivals, hunting in the forest and fishing. It is 42 km to the center of the province, and located within Tatlica Village of the district Erfelek. There are 28 small and big waterfalls one after another in a valley. It is unique in terms of having such waterfalls. 2-hour walk through the beech forests beside the waterfalls in a narrow and 2 km long valley is rather joyful and mind-blowing. It is possible to do activities such as trekking, having picnics, sightseeing, and hunting in the region which is a natural protected site. There are Gazi Camping Area, Karakum Camping Area, Yuvam Camping Area, Marti Camping Area around Akliman Region Demirkollar Camping Area the infrastructure concerning camping and caravan tourism of which are completed can meet all kinds of needs of the visitors. 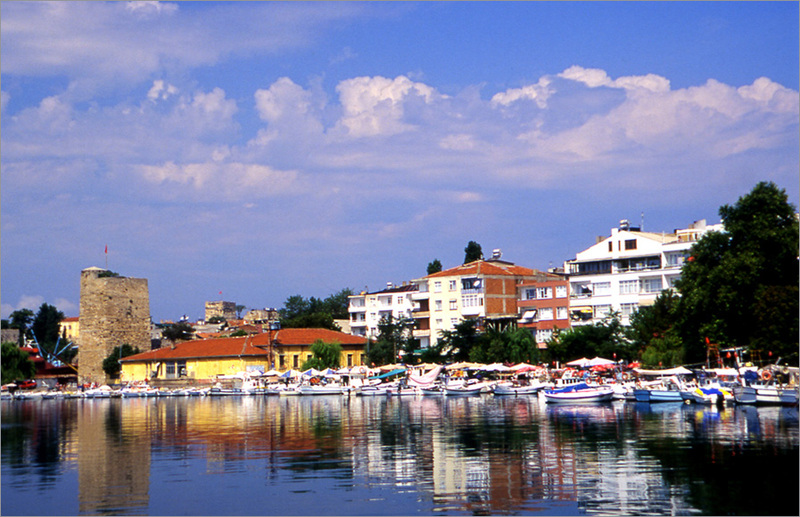 National and international sailing competitions are held in the center of Sinop. 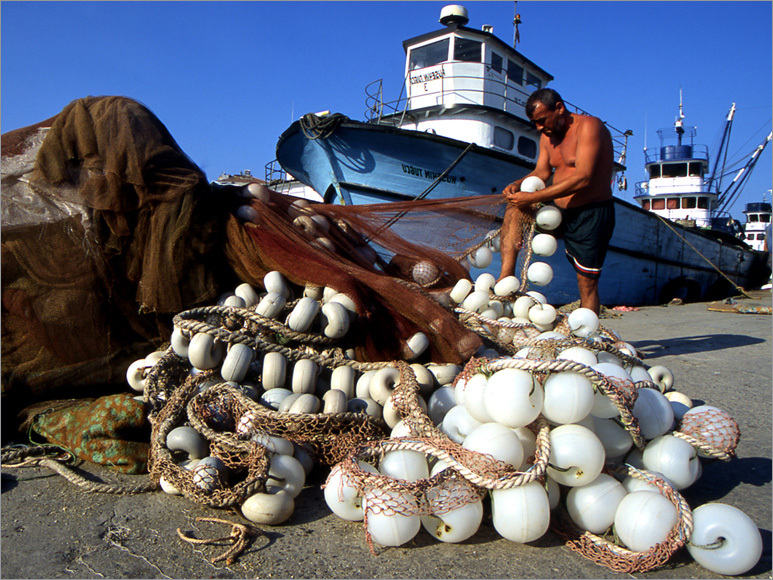 Fishing can be performed in the center of the center, in Ayancik, Gerze and Turkeli by naive and amateur fishermen as well as by big boats, and trawls. There are also some appropriate places for angling in the city. 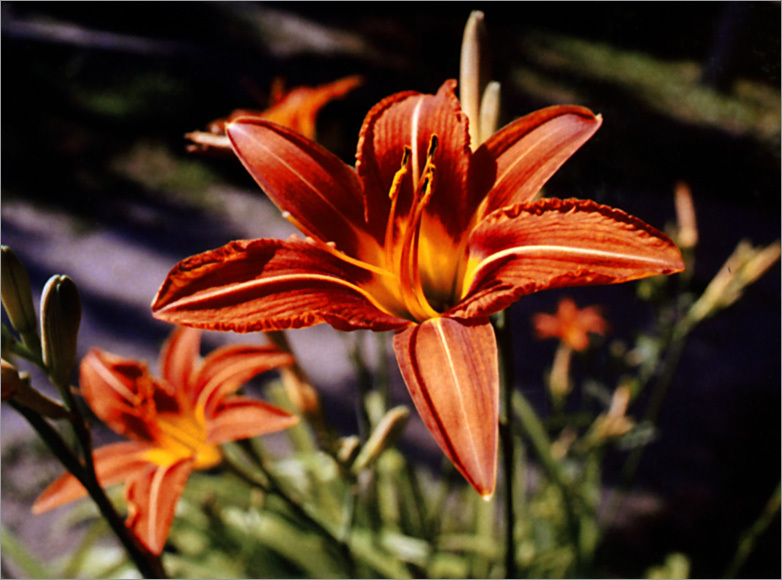 Foxes, jackals, and wild pigs can be hunted in the forests in the city and districts in any season. Wild duck, wild goose, woodcock and quail can be hunted in the appropriate season. Nohul (with grape, walnut, meat, yougurt); a cold dish made with dried beans and olive oil (Spring –Hıdırellez- Festival 5-6 May); corn cake; mamalika; keskes meal; anchovy stuffed meal; quince and chestnut meal; ear flour (stuffed with meat); islama; corn soup; corn paste, aborigine with vinegar, and leek with vinegar which are all traditional meals peculiar to the region ) must be tasted. The region is rich in terms of handmade items. Linen textile is done in Ayancik. Scarves are made by hand in the region and they can be both used as head scarves and for decorative purposes. Various kinds of textile and Duragan cloth are produced Duragan. One of the handmade items made in the centers of the province is ship modeling called as yachting by people. Moreover, handmade knife production carried out by Ozekes Family for 4 generations is also important.